I will make 50+ Edu and Gov Redirection Backlinks High PR Edu and Gov Authority Websites. Congrats! You've got your backlinks! Google Panda, Penguin & Hummingbird Safe. Now let’s get them indexed in Google. I will put all the Created Backlinks URLs into Mass Piner and "Ping" those successfully. I will use Rapid Indexer tools to get Index your all created Backlinks. I will convert all created Backlinks into RSS feed. RSS Feed will increase possibility Google Indexing rate. Backlinks from Educational and Government sites are the most Effective resources of a website because the .edu and .gov domains are not sold by any registrar on the internet. These are not ordinary sites which everybody can make. So, Search engines like Google, Bing, Yahoo! and others worth backlinks from .edu and .gov sites the majority. Backlinks will create on 50+ different high authority sites(PR10-PR7). That means your website will boost up on the most trusted and best-ranked sites on Google. Having Links on these Top Domains give more authority and trust to your site. These sites are Domain Authorities from DA 50 – DA 100. Imagine the amount of link juice and authority your site will benefit from these backlinks. These are long-term stable links & 100% White hat and fully Compatible with Google Panda, Penguin & Hummingbird updates. For One Page, order only one time & for Multiple pages, you can order as many as you need. So, what are you still looking? 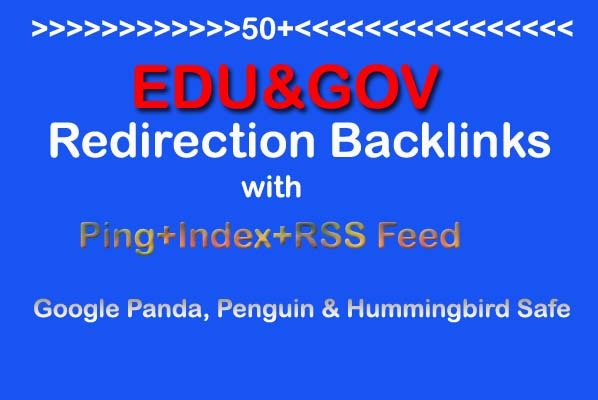 Make 50 Edu and Gov Redirect Backlinks(PR10-PR5) with Ping+Index+RSS Feed is ranked 5 out of 5. Based on 571 user reviews.